Pasta recipes are as versatile as they are delicious. 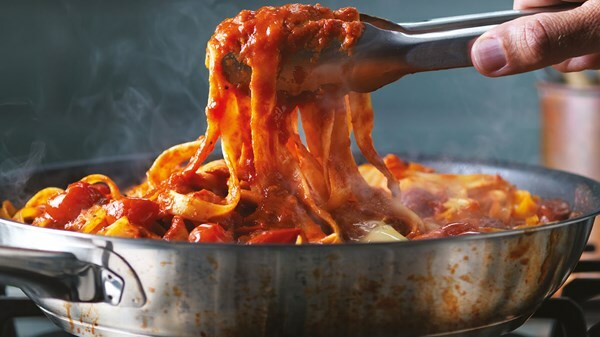 Any number of fresh sauces can be prepared with pasta, from the traditional tomato and basil based sauce to meaty ragu, salty anchovy and black olives, or even a creamy pasta bake recipe. A good pasta dish is filling yet light, ideal for eating all year round as a comfort food, simple mid-week dinner or dressed up for date night with a glass of wine and few shavings of parmesan. Simple pasta recipes require just a few simple ingredients, but once combined the rich aroma of a cooking pasta dish with a buttery white sauce is enough to set anyone’s stomach rumbling. Who’d have thought something as simple as dried dough made from just flour and eggs could be made into something so delicious. Records of pasta being made in this traditional manner go back at least 900 years. With a pasta recipe this good, we haven’t needed to change it! But pasta is rarely eaten plain. A good pasta sauce brings flavour and texture to a pasta dish. Oh, and don’t forget the melty cheese goodness to add to your pasta bake recipe. The traditional Italian way to eat your pasta is pre-mixed with the sauce before serving, rather than spooned on top. All pasta dishes with white sauces, from luxurious lasagnes to white wine and gorgonzola tagliatelle, need a good helping of butter. And of course, who doesn’t love nibbling on a freshly baked ciabatta loaf smothered in rich butter, while you wait for the pasta main course? Try using one of the spreadable Lurpak butter packs for your ciabatta for easy spreading. For those homey pasta bake recipes, try greasing the dish with butter for easier serving. You can also scatter cubes of butter over the top layer of cheese on your pasta bake or lasagne to add a touch of molten gold to your dish. Succulent lobster meat that falls apart on your fork. Handmade harissa butter to coat the lobster in. A side of creamy pasta. This is our new favourite dish for date night, entertaining guests and for special occasions! 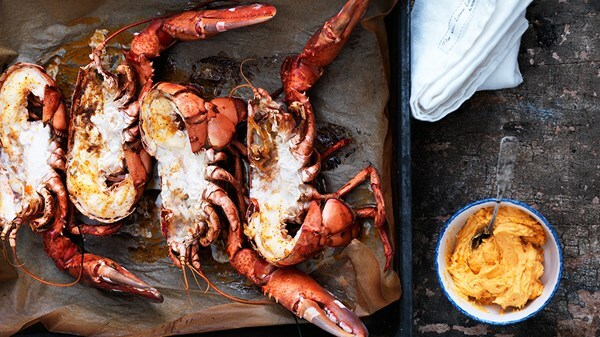 Give our grilled lobster with harissa butter a go and serve it with a pasta recipe of your choosing. With lower levels of mercury than other fishes, plus their high omega-3 fatty acid content, anchovies are a delicious and healthy addition to all healthy pasta recipes. Inspired by the traditional Italian pasta recipes served to sailors in southern Italy, our spaghetti with tomato and anchovy sauce recipe is bursting with savoury flavour. Try adding some black olives for an additional healthy twist! Last but certainly not least when it comes to flavour, here’s our vegetarian option that even meat lovers will adore. Thick, flavoursome, sautéed mushrooms dripping in a buttery sauce with tarragon, garlic and a hint of chilli can be made into an intense pasta recipe. Simple pour those mushrooms and rich sauce over penne and stir to coat the pasta in garlicy butter goodness.